Sarah is currently a PhD Candidate at the University of Saskatchewan where she is studying the horses of Sable Island. Using the pattern of cementum deposits in teeth to determine the age of mammals is common across many taxa. 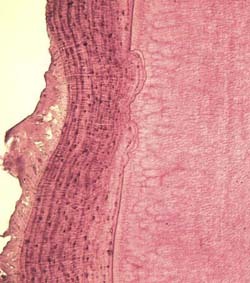 In bears, an annual growth layer group of cementum contains a layer of rapidly deposited light-staining cementum, and the more slowly deposited, dark-staining incremental line. 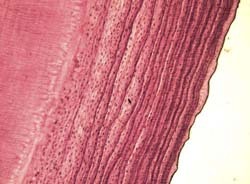 Research and technology has progressed to where inferences on several life history events may also be derived from recording structures such as teeth and bone. My research built on the existing knowledge of recording structures by examining the pattern of cementum deposition in teeth collected from the western Hudson Bay population of polar bears ( Ursus maritimus ) for indications of cub rearing, growth, and stress. In black bears ( U. americanus ) the reproductive histories of females can be determined by examining the spacing of cementum annuli . Reconstructing reproductive histories has also been attempted in grizzly bears ( U. arctos ), but had not yet been applied to polar bears. When female black bears are accompanied by cubs-of-the-year, the corresponding growth layer group is noticeably thinner than years in which females are alone, or in rare cases, accompanied by yearlings. The cause of this decrease in cementum deposition is attributed to the increased demand in calcium and other nutrients that are placed on the female during lactation. Female polar bears use significantly more resources to produce milk for cubs-of-the-year than for yearlings. 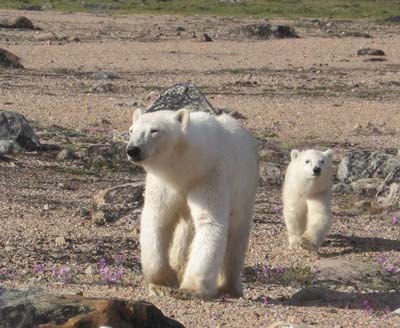 Lactation stress, in addition to the stress of fasting for prolonged periods in the western Hudson Bay population should promote a pattern of cementum deposition that reflects cub production and infer the recruitment of minimum aged individuals to the population. It has been questioned whether or not patterns of cementum deposition may also reflect physiological conditions. Poor diet and suppressed growth has been shown to result in a reduced thickness in cementum. Current climate trends indicate warming temperatures in the Arctic, leading to a reduction in the extent and duration of the sea ice , and in bears having reduced access to their prey. A decrease in the condition of bears, natality, and proportions of yearling bears between 1981 and 1998 in western Hudson Bay has been noted. A decline in body mass and the reproduction rates and cub recruitment is also recorded. These reductions were attributed to the earlier break-up of sea ice as a result of increased air temperatures . Because of these known phenomena, the effects of climate change and/or the resulting stress on individuals and populations may be recorded within the cementum patterns of teeth from local wildlife. Patterns of cementum resorption may also disclose an individual’s life history (e.g., weaning) or may reflect stress caused by other factors (e.g., nutrition, climate, or environment). Cementum is more resistant to resorption than bone and is not generally affected by a systemic demand for calcium. Resorption of cementum is known to occur as a result of trauma or excessive occlusal forces which may occur during the subadult or weaning phase of a polar bears life when young bears are often forced to scavenge. Extrinsic factors have also been associated with increased resorption. My research concentrated on the western Hudson Bay population of polar bears which is a southern population and perhaps the most impacted by climate fluctuations. For over 40 years, premolars have been collected from bears in this region for the purpose of age determination; additional information on individual bears and a large number of known aged bears makes this population ideal to develop and test models to infer cub rearing, growth, and stress from the pattern of cementum deposition. Methods developed in this study will increase the knowledge of polar bear ecology and provide more information on population trends. I completed my B.Sc. Hons. (Ecology) at the University of Manitoba (2004) where in my final year I completed my honours research project on partial-depredation of waterfowl nests by striped skunks ( Mephitis mephitis ). During that time I was also gathering data on the ontogeny of defensive behaviours by juvenile skunks. Before my arrival at the University of Alberta I was involved in the conservation of the Mojave Desert tortoise (Gopherus agassizii) through the Biological Resources Research Center (University of Nevada, Reno) and assisted in research on the behaviour and habitat use of feral horses (Equus caballus) in the Spring Mountains, Nevada (University of Nevada, Reno). Larivière, S., Y. T. Hwang, W. A. Gorsuch, and Sarah A. Medill . 2005. Husbandry, overwinter care and reproduction of captive striped skunks ( Mephitis mephtitis ). Zoo Biology 24 :83-91.